E very year there are countless books written about leadership and management, supplement- ed by a mountain of similarly themed magazine articles and scholarly treatises, eagerly snapped up by legions of wanna-be bosses and offi cers. As a culture, we are obsessed with leadership, especially leaders as heroic fi gures, and we are constantly seeking the right for- mula to make us so. But all those would-be captains of in- dustry – and the oceans – might fi nd it a lot easier to step away from the stacks and take a page from a leader extraordi- naire, retired Admiral and former Com- mandant of the Coast Guard, Thad Allen. 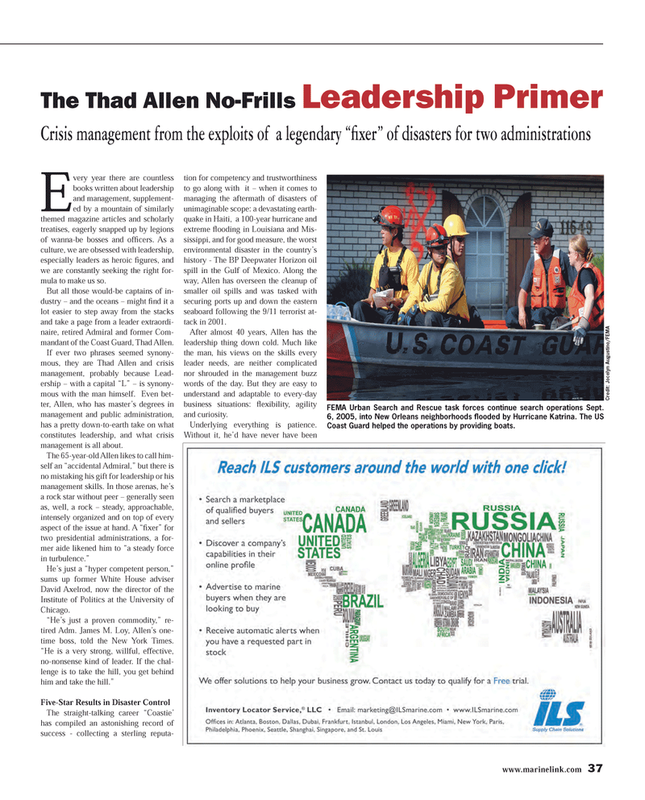 If ever two phrases seemed synony- mous, they are Thad Allen and crisis management, probably because Lead- ership – with a capital “L” – is synony- mous with the man himself. Even bet- ter, Allen, who has master’s degrees in management and public administration, has a pretty down-to-earth take on what constitutes leadership, and what crisis management is all about. The straight-talking career “Coastie’ has compiled an astonishing record of success - collecting a sterling reputa- tion for competency and trustworthiness to go along with it – when it comes to managing the aftermath of disasters of unimaginable scope: a devastating earth- quake in Haiti, a 100-year hurricane and extreme fl ooding in Louisiana and Mis- sissippi, and for good measure, the worst environmental disaster in the country’s history - The BP Deepwater Horizon oil spill in the Gulf of Mexico. Along the way, Allen has overseen the cleanup of smaller oil spills and was tasked with securing ports up and down the eastern seaboard following the 9/11 terrorist at- tack in 2001. After almost 40 years, Allen has the leadership thing down cold. Much like the man, his views on the skills every leader needs, are neither complicated nor shrouded in the management buzz words of the day. But they are easy to understand and adaptable to every-day business situations: fl exibility, agility and curiosity. Coast Guard helped the operations by providing boats.